Intel is facing a hard time keeping up with the high demand for their 14nm process based CPUs. This has led to severe price hikes across their current-gen, consumer aimed CPUs and that has negatively affected their market share in various regions. One of the largest retailers at Germany, Mindfactory (via Ingebor at Reddit), has revealed that the Intel’s direct competitor, AMD, has seen their market share almost doubled since August. There are two sides of this story, first is that Intel CPUs are high in demand and at the same time, the Intel’s 14nm capacity is already operating at its limits. This affects not only Intel’s Core family but also affects their Xeon chips and 14nm based chipsets which are used on current-generation motherboards. The second side of the story is that since there are not enough Intel CPUs reaching consumers and those that are come with a price hike, the demand would eventually lessen until the situation gets better. This results in the CPU market share of Intel to fall drastically in areas that are heavily hit by low supply and huge price hikes. The surprising return to PC TAM growth has put pressure on our factory network. We’re prioritizing the production of Intel Xeon and Intel Core processors so that collectively we can serve the high-performance segments of the market. That said, supply is undoubtedly tight, particularly at the entry-level of the PC market. We continue to believe we will have at least the supply to meet the full-year revenue outlook we announced in July, which was $4.5 billion higher than our January expectations. We are investing a record $15 billion in capital expenditures in 2018, up approximately $1 billion from the beginning of the year. We’re putting that $1 billion into our 14nm manufacturing sites in Oregon, Arizona, Ireland, and Israel. This capital along with other efficiencies is increasing our supply to respond to your increased demand. 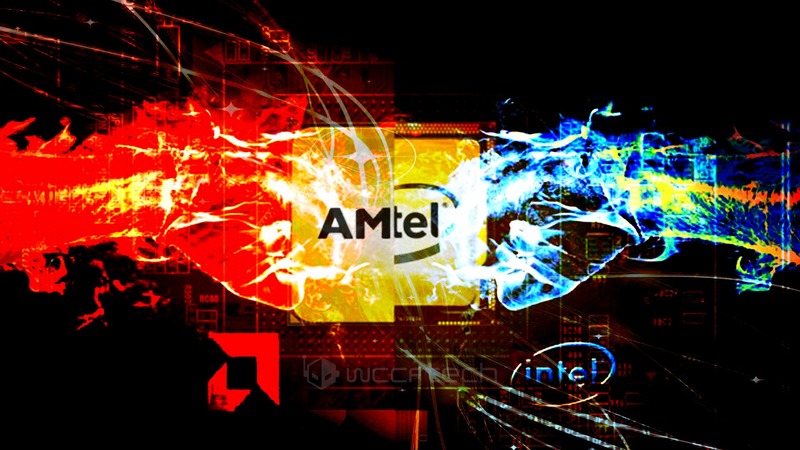 Now coming to the market share results, in September, AMD’s market share at Mindfactory climbed close to 65% while Intel’s share fell to around 35%. This is a major change compared to previous months where both rivals were neck-to-neck in terms of CPU market share. 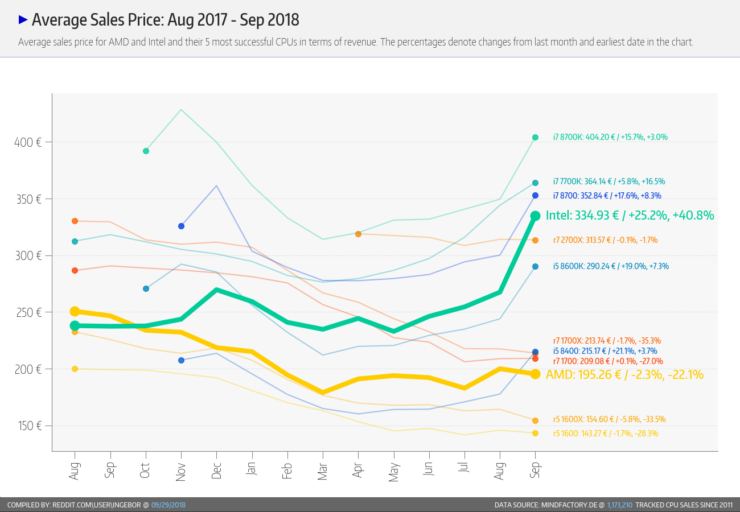 Similarly, AMD CPU sales hit as high as 3000 units sold in a single week in the month of September while at one point, Intel’s weekly sales in the month of September fell below 1000 units. This was due to the price hikes which saw Intel CPUs sell at an average of 50% higher compared to their reference prices a month earlier. 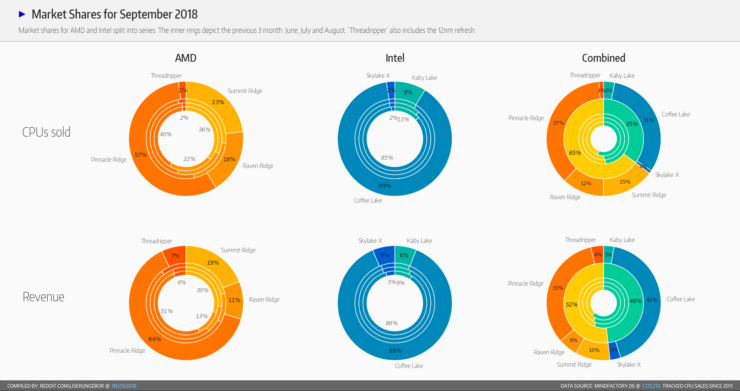 Out of AMD’s 65% total market share at Mindfactory, 57% was Pinnacle Ridge (Ryzen 2nd Gen), 23% was Summit Ridge (Ryzen 1st Gen), 18% was Raven Ridge (Ryzen APUs), and 2% was for the Ryzen Threadripper CPUs. Out of Intel’s 35%, 89% was for Coffee Lake CPUs (8th Gen), 9% was for Kaby Lake (7th Gen), and 2% was for Skylake-X (Core-X) CPUs. The Ryzen 7 2700X and Ryzen 5 2600 are the most popular AMD CPUs at the retailer while Intel’s Core i7-8700K remains the most popular Intel 8th Gen Core processor. This is for the first time that we see AMD’s Ryzen CPUs having a higher market share than Intel’s most popular high-end processor choice. Another interesting to note is that since Ryzen first launched, the average number of cores on both AMD and Intel CPUs has reached 6. Also, the price per core has been falling drastically in the multi-core era. AMD still leads with the most amount of cores available at the lowest price and we can expect this lead to remain intact for quite some time in the future. With high-performance chips such as Ryzen Threadripper that boast up to 32 cores at under $2000 US, less than Intel’s 18 core option, we can see why AMD is in such a good position in this $ per core segment. And while time may not be on Intel’s side at the moment, they offer some of the fastest consumer aimed CPUs for gaming and are going to deliver an even higher number of fast cores in the coming weeks. Which brand processor are you currently using in your PC?